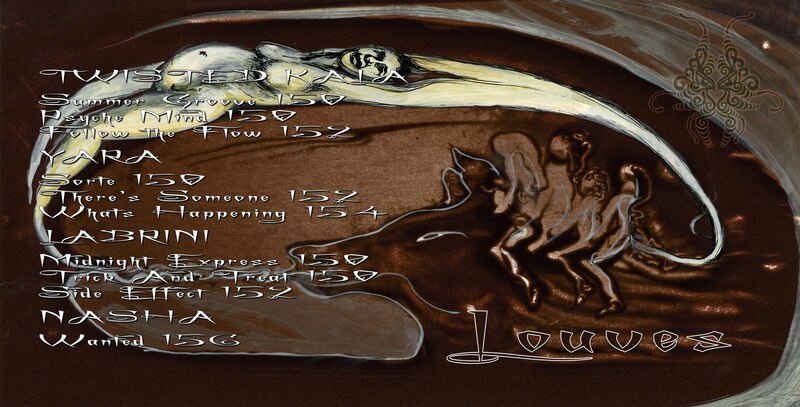 LOUVES (She-Wolves) CD4 Coming auwoooh soon! Just a quick note to let you know, we are close to announcing our next release, LOUVES! With our 4th release, LOUVES, Lycantrop honors the spirit of the feminine divine, presenting the unique and powerful talents of she-wolves Kala, Nasha, Yara and Labrini. Let the she-wolves take you beyond moments, beyond time, beyond thoughts of male/female or any other illusory versions of separation. For the act of creation is only complete when you join in! As a gentle reminder of the ever-subjective and dual nature of experience, we hope you will agree that these vibrations are not only feminine but also and simply: excellent music. Releasing in September. Sound Samples, album art and more info will be online soon. Mastering by MadMaXstering. Wishing you much daysun and nighthowling! 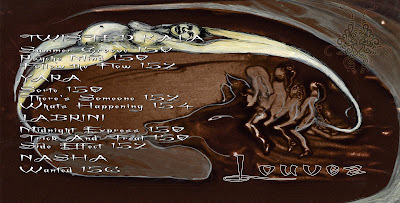 ps - artwork will be 16 page booklet based on original sand paintings by Charley Case, together with David Demazy with handpainted adaptations by Lycan sister Darshana Bolt, whose artwork (and singing and dancing) are frequently on display in Burlington, Vermont. A recent review of her artwork is here. Auwoooh!!! Doesn't it feel good to howl? HYBRID EVOLUTION is coming along nicely - we are on schedule for a May release. Artwork by visionary artist Neil Gibson looks GREAT: as soon as it is final, final, final, we will share with you! And with collaborations like these, we hope to delight every ear! STARDUST is the "companion EP" we will co-release on same date as HYBRID EVOLUTION. As most solar systems are binary, we decided to release a companion, STARDUST, to accompany HYBRID EVOLUTION on its aural and astral journey. STARDUST is a digital only EP and will be available through digital distribution (Dist Electronic, Cytopia, etc). The best way to get STARDUST is FREE. A thank you from us and the artists who contributed tracks with open hearts. How can you get STARDUST for FREE? Easy: purchase HYBRID EVOLUTION and it is yours in FLAC. Anyone who wants to pre-order from us directly (special price , please get in touch: lycantroprecordsadmin@gmail.com . Mini update! Hybrid Evolution (yes, we tweaked the spelling a bit) is still on track for release in April. Tracklisting any day now, promise. We are happy to confirm a "companion" EP called Stardust - 6 amazing pure psychedelic tracks from global talent plus plus plus - Stardust will be a free of charge BONUS EP for who buys the Hybrid Evolution in CD format, or digitally (exclusively through our webshop). Even more goodies in store for the Hybrid Evolution release (hint, Neil Gibson is the cover artist), so stay tuned! PA SWORE A RAT ROAR! First person (1 winner only, you can submit on any forum/group or send email to lycantrop.records@gmail.com) to unscramble the 2 artists hidden inside: Hybrides Evolution CD is yours. Head's up - heavy music dropping your way! Hardhat recommended. Facebook Overload spurs Lycantrop message of revolution! For obvious reasons (see image of our Facebook inbox! ), we must start to block/ignore all but the most beautiful and/or perosnally meaningful inputs from truly connected souls!Please do not be upset if we do NOT acknowlege your Facebook invitation, mail, gift, etc. Good example: If we don’t know you or your music, we cannot possibly join your FAN club! Games, don't bother to invite us. It's cool to have some fun, but overall, all this STUFF is a power-led effort to keep the natives from getting restlesss...bread and circus. That reminds me, have you heard the anecdote: Two thousand years ago, a Roman Senator suggested that all slaves wear white armbands to better identify them. No," said a wiser Senator, "If they see how many of them there are, they may revolt." The idea with all this social media, for us, anyway, is to connect with the right people with the right info, at the right time. We try not to bombard you personally with a lot of group-this, send-to-all that. Our not-so-secret focus is on sharing in the raising of consciousness. Facebook is just another tool. Like music, human brains and egos. In previous evolutionary leaps, it was a naturally occurring adaptive advantage that wrought dramatic species change. The ability to blend with your surroundings like a leopard with his spots, or coral fish indistinguishable from its habitat. Now, humanity will decide for all life what the next step will be. Conscioussness is the ultimate expression of life's urge to manifest. The next stage of evolution has to happen there, a further refinement of the brain as adaptive advantage can fulfill its fractal destiny either via collapse or expansion. Expanded consciousness is nothing more than the collective pooling of consciousness via the Global Brain which is the sum total of all information and interactions on the internet (framework, nodes are analogous to neuronal synapses). You, see, we have the key, and it is greater and more powerful and smarter than any subset organization. If we fullfil our expansive destiny, there will be a synchronization of the global mind, and a common commitment to developing sustainability on our planet as the fundamental guiding principle of humanity, overarching all political, NGO, religious, cultural, ethnic AND CORPORATE affiliations, a global culture shift so powerful that no dam can hold it back: a united global humanity who says NO TO ANYTHING BUT PLANET FIRST! We need lots of hearts and minds: like Ghandi's peaceful resistance, it only works when you reach a tipping point with the masses. I love to have fun and be happy as much as the next one. But, the hour is urgent even if the elite and power structures of the world would have us think otherwise. Those who understand the situation have a moral obligation to take a stand. Thanks for being connected to Lycantrop. Feel free to send a personal message - we love real, meaningful contact! Check it out, peeps! 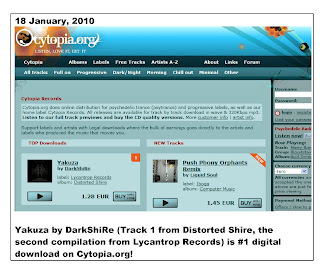 Lycantrop releases* can now be found on Cytopia (big thanks to our master partner for digital distribution, Dist Electronic), and "Yakuza", DarkShiRe's hypnotizing first track from our 2nd comp Distorted Shire, is #1 on the night / darkpsy charts! DarkShiRe is really making his mark these days, with collabs with Furious, an amazing Soulcraft side project AND a new Septagram EP just released on free digital label Ektoplazm (download here). Warm appreciation to Yves and the crew at Dist Electronic, thanks to their hard work, you can now find Distorted Shire just about everywhere you might be looking for digital sounds, including Beats Digital, Juno Download, AudioJelly, DistElectronic's own site and Napster...to name just a few. Distorted Shire is the result of close collaboration with Mario from Greece, who is not only the artist known as DarkShiRe but also co-producer on projects Septagram and Kokobloko. DarkShiRe and Mind Distortion System sounds form the heart of the album – the 2 artists collaborate on 2 tracks, then each have their own material and collabs with a cast of all Greek artists….Dark Elf's influence is also not to be missed - as he joins forces on "Snake in the Grass" from Septagram (Dark Elf/DarkShire project), as well as "Groovy Minds" with Mind Distortion System), - and mastered half the tracks. The release has gotten great response on dancefloors and listeners around the world, so if you love Lycantrop and want to show your support, digital is an affordable way to send some funds in our direction. Did you know, if all our friends and fans (that means: you, you & YOU! )on MySpace + Facebook bought just 1 track each for an average of 1$/€/£, we could immediately pay EVERY ARTIST WHO HAS EVER RELEASED WITH US 100 Euros - believe me, they would really appreciate that)! And remember, all our releases are fully available as MP3 downloads on Last FM so you can decide what you really like! Thanks again for all the support; let's have some fun in 2010! And again, big ups to DarkShiRe for the tremendous response on his track, "Yakuza".